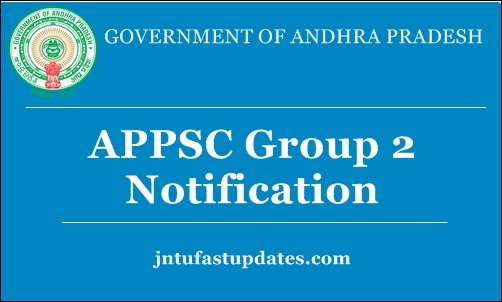 APPSC Group 2 Notification 2019 Application Form/ Apply Online : Andhra Pradesh Public Service Commission (APPSC) released the notification for a total of 110 CF + 336 Fresh vacancies. Aspirants waiting for the AP Group II notification 2019 can go through this article for complete details. The proforma application will be available on Commission’s Website (https://psc.ap.gov.in) from 10/01/2019 to 10/02/2019 (Note:09/02/2019 is the last date for payment of fee upto 11:59 mid night). The Commission conducts Screening test in offline mode in case applicants exceed 25,000 in number and likely to be held on 05/05/2019. The main examination in online mode for candidates selected in screening test will be held through computer based test on 18/07/2019 & 19/07/2019. Andhra Pradesh Public Service Commission works for the AP State government related works. APPSC provides affiliation for various government organizations in the state. The Andhra Pradesh PSC releases various notifications ever year to hire the suitable aspirants into various designations in government organizations. APPSC has now come up with Group 1, Group 2, and Group 3 notifications to hire the suitable aspirants into various vacant positions. Aspirants having the suitable educational qualification can apply for the APPSC jobs through it’s portal, psc.ap.gov.in. Interested aspirants can go through the details of APPSC Group Notification 2019, eligibility criteria, and other details from the following. APPSC Group II Vacancies include Asst., Section Officer, Asst., Registrar, Extn., Officer, Dy. Tahsildar, Executive Officer Gr.I, Municipal Commr., Gr.III, Senior Accountants, Excise Sub-Inspectors posts. The notification released for 446 Group II posts. Interested and eligible aspirants can apply for these posts through online at psc.ap.gov.in. Candidates have to apply only through online. While applying, they have to pay the requisite application fee. its a good opportunity for andhra students for applying online and should write a preliminary exam. that means people will get qualified based on cutoff marks. now a days getting government job is like a hot cake. many people are competing for each and every post. so competition will be very high. people should prepare according to the given mentioned syllabus properly without leaving any topic for getting chance to write mains and get qualified. For more details such as application process, eligibility criteria, selection process, and other details scroll down below. Note: The details of vacancies viz., Community, Zone, State wide and Gender wise (General / Women) may be seen at Annexure-I. Applicants can go through the educational qualification details from the APPSC Group 2 official notification 2019 for job-wise qualification details. No person shall be eligible for direct recruitment if he/she is less than 18 years of age and if she is more than 42 years of age as on 01/07/2018 as per G.O.Ms.No.132, GA (Ser-A) Dept., dated:15.10.2018. Candidates should not be born earlier than 2nd July 1976 (except Post Code No.07) and not later than 1st July 2000 (except Post Code No.07). Candidates waiting to check the pay scale details can go through the notification. Also, the aspirants can find the ‘APPSC Group 2 Online application form 2019’ on the website. STEP-II: The applicant has to login in the Commission’s website with the user name (OTPR ID) and the Password set by Candidate. After Login, the applicant has to click on the “Online Application Submission” present in the bottom right corner of the Commission’s website. PAYMENT PROCESS: The Applicant now has to click on the payment link against the notification number that he wants to apply. The basic details required for calculation of the fee and age relaxation will be prepopulated from the OTPR data. The applicant has to verify all the details that are displayed. Once the Payment form is submitted, the respective details (used for calculation of fee and age relaxation) will not be altered in any stage of application processing. Hence if any details are to be changed, applicant should use the modify OTPR link, modify the details, save it and again click on application payment link. I studied msc nutrition.am I eligible to this posts or not. Are final year btech students are eligible or not??? can we select a particular post for appsc grp2 2019 notification..